From time to time Pete had occasion to play against Don Cherry in the minors and as a fitting tribute to Pete’s rugged qualities it is reported that Don once stated on Hockey Night in Canada that “Pete Wright was the toughest player he ever played against”. Pete came by his toughness honestly as the youngest of four brothers, all athletic and “hard nosed”. He was the first Grande Prairie lad to make it to the pros and that is remarkable. In his era there was no minor hockey program in Grande Prairie, no experienced coaching and no connections to the outside hockey world. Minor hockey consisted of rare trips arranged by parents to nearby towns for scrimmages on outdoor rinks using shredded equipment and hand-me-down skates from older brothers, Roy and Cliff. In 1944, when Pete was seventeen, a group of army reservists recruited him to play for D-Company, Grande Prairie’s senior team and his career was underway. From the beginning he was a hometown favorite known for his exceptional skating skills, outstanding defensive ability and rugged, "take no prisoner" style of hockey. His transition from Grande Prairie to the pros is a mystery. Did he learn about a hockey camp and tryouts? Did he pack his equipment in a duffel bag and hitch hike to Edmonton and show up as a “walk on” for a try out? It is not a mystery to those who had seen Pete play that he made the cut when given a chance to show case his skills and made it to the pros. As a pro he was Montreal’s property and moved around in the minors for eight seasons; 506 games (1951- 1960) with the Sherbrooke Saints, the Buffalo Bisons, the Edmonton Flyers, the Seattle Americans, the New Westminster Royals, and the Victoria Cougars. Until he broke his pelvis at training camp, the Canadiens had designs on Pete as a "blue liner" to take the place of Butch Bouchard. In 1950 Pete helped the Edmonton Waterloo Mercurys win the World Championship in London. He was an all-star defenseman with the Earl's Court Rangers in the English National Hockey League and before that he played in the Western Hockey League with the Saskatoon Quakers and for St. John in the Eastern Hockey League. During the first period of his first game with the Rangers Pete delivered a clean, bone-crushing hit that sent an opposing forward sprawling to the ice. The home town British spectators booed him as the game went on. Between periods the coach congratulated Pete for the hit and went on to tell him that the next time he knocked an opponent down he should go through the motions of helping the victim regain his feet. From then on Pete was a home team favorite. With his pro career over, Grande Prairie welcomed Pete home in 1960 where he coached and played with the Athletics while operating his own sporting goods store. Reflecting on Pete’s playing career and considering his contributions upon his return to Grande Prairie he easily qualifies in both the Legends player and builder categories. He was always anxious to share his knowledge of the game with others spending six years coaching peewee, bantam and midget hockey and the senior Athletics. He was Stan Neufeld’s mentor who played with Pete on the Athletics at age 15 and tried to emulate Pete’s rough and ready style. However, playing against older and bigger competitors Stan often ended up on his “duff”. After one such encounter that sent him to the ice Pete told Stan he wanted to advertise his sporting goods store on the bottom of his skates. Stan reports that Pete was “unusually talented, played a “take no prisoner” style of hockey and was very protective of his teammates, especially the young guys”. His sporting goods store was a gathering place for his protégées. He was a hometown hero. Pete put Grande Prairie hockey talent on the radar of hockey organizations everywhere and at home he eagerly set to work developing talented young players and encouraging them to make the most of their abilities. As a scout for the Detroit Red wings and the Edmonton Oil Kings, their farm team, he created a conduit for local young prospects to realize their hockey dreams. Galen Head, Stan Neufeld and Dave Emerson were among the local kids he tutored and who moved on to play at a different level. 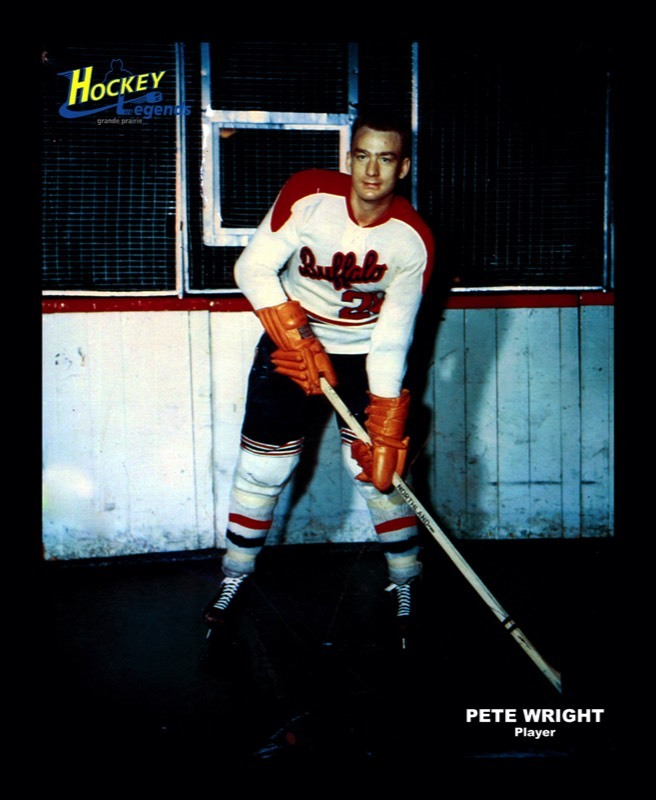 Pete Wright - a Grande Prairie Hockey Legend in 2004.